Hope that title caught your attention. Fact is I had the most amazing experience learning proper barefoot running technique from the coaching team of VIVOBAREFOOT. I literally felt liberated and born again, no exaggeration. Of course, it’s not as simple as just taking your shoes off and running. 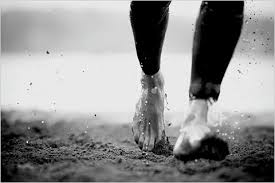 Luckily I had the priviledge of learning from the students of Lee Saxby, the authority on barefoot running. A lot has been made of this book called Born to Run, Chris McDougall. The book that allegedly sparked a revolution. Well, Lee Saxby was McDougall’s coach. Also present (as a learner) was a London Marathon expert and advisor to over 50 charities on long distance running, Greame Hilditch. His book on running marathons has even helped BBC presenter Sophie Raworth to complete her marathon, a year after collapsing in one. It was thus an honour to be in such esteemed company, training in a centre just down the road from me at PremierGlobal, North London. Say what you like. Most people say I look healthier in the second video, some say I look weird. One thing is for sure, I am a lot happier. It has given me the motivation to take up more running and it might be the answer to beefing my tiny calves. Of course you don’t have to be totally barefoot and there are a lot of ‘barefoot’ trainers out there. 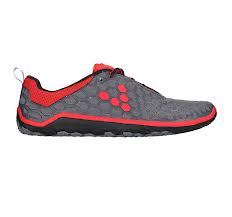 However, the VIVOBAREFOOT model has a proper training philosophy behind it, most notably the importance of toe-splaying which is compromised by the five-finger models. As a result, VIVOBAREFOOTs even look like normal shoes so a double bonus. There’s a whole lot more around this phenomenon. Learning to strike with the forefoot as opposed to heel is a skill that isn’t just acquired and needs to be learnt and I am still in that process. Sure I can coach and advise people on this but I am on the journey myself but it is a challenge that I am relishing and looking forward to sharing my findings with you. So read up the resources given, as well as the stuff on the VIVOBAREFOOT website and make an informed decision as to whether you wish to embark on the same journey. Some people like Greame has said that he has been fine running marathons for fifteen years in cushioned trainers so he probably won’t change, so make the decision that is right for you.